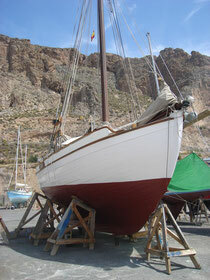 And so we were lifted and spent 8 long days scrubbing, scraping, caulking, sanding, painting. The power wash not only got rid of all the barnacles, weed, slime, flakes of paint, loose tar etc, but also showed us where our little leak was situated. Which turned out to be not so little and the paint must have been quite good to have kept that hole covered! We were glad not to have decided to sail on much further because that old plank might have started to leak quite seriously quite soon. Peter did a temporary epoxy repair and took the measurements of the three planks that will need replacing some time. For the rest I kept myself occupied by prepairing and painting the more than 70 square metres of Eos' underwater bit. Relaunching we were kept waiting for nearly all day and still I never thought of having the camera ready! So here a picture of the day before.